Last 2 weeks bulls exhibited their power to completely out-power the bears. Global markets too were in a mood of expansion. Better macro-economic data and descent corporate results are supportive to higher moves in markets. But is this the right time to buy Nifty? Technical Overview: Last week Nifty opened at 8166 and closed at 8220. That was hardly a range of 55 points. This small green candle exhibits lost momentum in current ongoing trend. Markets in cycles of expansion and contraction. Currently Nifty is experiencing one such contraction period. 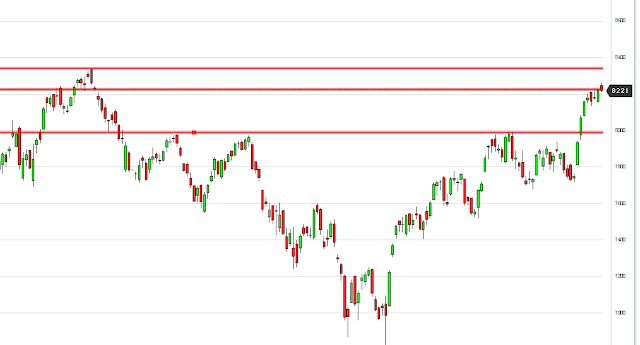 Nifty is also trading near a broad resistance area between 8240 and 8336. There is a possibility that Nifty can consolidate near current level or it may correct a bit to its immediate support. My View: Every correction in Nifty is a buying opportunity. This may not be market for short selling unless you are very aggressive Swing trader, through a short-selling opportunity exists near the resistance areas as mentioned above. However better trade is buy on every dip. Buying at current level is not offering us a great risk reward ratio. I have been writing about start of an uptrend in Nifty since early March 2016. Technical Analysis can help us identify the moves at the very beginning and thus help in gaining maximum profits. Below are some of the articles (Nifty View) through which I had sent a message to readers of this newsletter about Nifty's Bulls run. Similarly I identify fast mover stocks and help my subscribers to earn decent profits in short-medium term moves. I time to time publish articles on my analysis of these kind of stocks on my blog. Most of these stocks have earned decent returns. No tall claims but a genuine analysis and 'keep it simple' strategy helps my model portfolio subscribers / training participants grow their wealth.